Being in the right place, in the right mood, at the right time, could be key to your article writing success. We often hear about athletes and other competitive individuals getting into “the zone” before a competition. “The zone” is really nothing more than a frame of mind that focuses all of our energies, both mental and physical, on the task at hand. The techniques that help get these people into their zone are as varied as the people themselves. For some it’s a routine, born of superstition and experience. For others, it’s a place or a smell or a sound that gets them psyched up. Believe it or not, writing articles is competition, too – with yourself. Every time you sit down to write you’re competing with all of the other things in your life that are fighting for your attention. If you can’t put yourself into a zone that focuses you completely on the article topic at hand, your writing is going to suffer – both in quality and quantity. Routines – These are the little rituals you repeat every time you sit down to write. Maybe the first thing you do is get a cup of tea in your EzineArticles mug. Then you go to your writing room and shut the door. After that, you put on some music that suits your topic. Then, and only then, do you start writing. Locations – Surround yourself with the environment of your topic and simply let the environment inspire you as you write. For example, if you’re writing about car audio systems, why not sit in the passenger seat of your car with your laptop and jam to great tunes while you write? Or write about great cuisine from a table at your favorite sidewalk cafe. Triggers – Triggers engage your other senses to positively influence your writing. Imagine writing about how to make a great loaf of bread while the smell of fresh baked bread wafts through the air. Or writing about competitive swimming from a poolside table with the sounds of splashing water in the background. If your topic doesn’t lend itself well to one of these techniques (downhill skiing, for example), consider taking part in the activity and then writing immediately afterward while the experience is still fresh in your mind. Remember, EzineArticles does not condone the writing of articles while participating in dangerous activities. 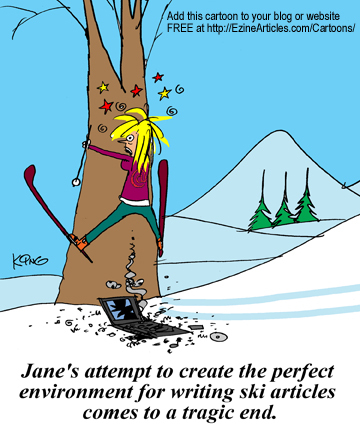 We don’t want you to end up like Jane in the cartoon! We do, however, condone doing whatever it takes to safely channel your energies into producing high-quality, original articles. So spend the next few minutes thinking about your article topic areas and then try to come up with something you can do or someplace you can go that will put you in the right frame of mind for each of those topics. Now put your ideas to the test. Did psyching yourself up have any effect? Did an inspirational location help you get into “the zone?” If so, learn from the experience and use it in other areas of your life. If not, try something else. Either way, come back here and leave a comment to tell the rest of the EzineArticles family what worked … and what didn’t. I typed the first paragraph of an article out and sat frozen to my chair. Suddenly, I heard a tune on the TV and I’m not kidding, my whole mood changed and thoughts began flowing. I recognized what was happening. So, I’m a firm believer that music works for me. What a coincidence. Thanks EzineArticles . Yes, every writer knows the essence of putting himself in the mood to writing an article or two. And the more he knows his in the mood to writing, the better his chances of putting his ideas into words, and of course, producing quality article/s as well. Good thing, we have great mentors around who know how to share wisdom. Yes, I agree..knowing the background and “the zone” your good at could help you create one great article. Ya Marc, I completely agree with you, if you can channel the energy and thoughts that happen at the right moments, we can create some inspired articles. For this use, I find my laptop to be the best use. Sometimes, I just scribble away the article ideas on paper napkins. That’s a good mantra to have. I’d add “plan the moment” as well. We can’t always be lucky enough to have the muse show up when we need her, so sometimes we have to lure her in. Excellent article title – got my interest straight away…i am a great procrasinator so have to be very disciplined re getting into my “routine zone”….that can stretch forever! Trigger approach woks best for me – the best time to write a yoga based article is straight after yoga practice, when I am zoned out, chilled and instantly focus on writing. Excellent suggestions! I particularly like the idea of planting myself in the environment of the topic I am writing about…going to try it. I am just starting to learn to write on my blog. I thought I would practice with the snow sports of skiing and snowboarding. I will in the environment full time this winter and it just gave me a boost. I will definitely be bring my laptop along, but leave it in the chalet. lol….